Welcome to the Ash Class blog! : 100 word challenge! 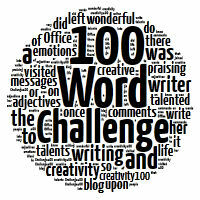 Here's another writing activity to get involved in - the 100 word challenge! Each Wednesday evening a new prompt (usually a picture) is posted, along with a five word prompt. For example, the most recent one was a picture of the Eiffel Tower and the five words were Silver, Tiny, Paris, Birthday and Jumped. You then do a 100 word piece of writing to do with the picture which also contains the five words. Every week there is a showcase of peices of writing on the website. We'll have a go this week!